Transmits BNC composite video up to 2,000 feet in black/white, and 1,300 feet in color using a single twisted pair of CAT5 cable. 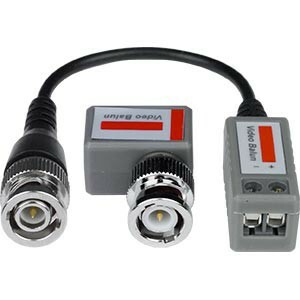 Passively transmits real-time monochrome or color composite video over a single twisted pair of CAT5 UTP cable. Supports CCTV Security Cameras and DVRs. Connectors: 75 ohm male BNC Video, positive and negative screw terminal connectors. DC Loop Resistance: 52 ohms per 1,000 ft (18 ohms per 100m). Includes a pair of BALUN-STBNC tranceivers.